Did you know that 45% of all moves occur between Memorial Day and Labor Day? As the selling market and summer season ramps up in Central Florida we’ve collected our best advice to make moving easier. When unscrewing hardware from furniture, collect it in a Ziploc bag and tape it to the furniture. This saves time and lost nuts and bolts. Purchasing boxes and a good packing tape can keep your stuff safe and make it easier to stack and move. Also, most packing supply places offer packs of blank newspaper that keep your breakables clean. Pack a box with your sheets, towels, toilet paper, and toiletries. Make sure it is clearly labeled and kept separate from your other boxes so that you can unpack it easily and have the essentials ready to go. Cleaning your new place before you’ve unpacked allows you to get in the nooks and crannies. We also like to put shelf paper in the drawers and cabinets of the kitchen and bathroom. If you are moving a distance and will need to store items for any amount of time, consider the cost-benefit of storing those items compared to replacing them once you have moved. Do as much as you can before you move – set up your utilities, change your address, and schedule a cable appointment (we can’t live without wifi!). This will ensure a smooth transition to your new home. For those of you moving to Central Florida, the MOVE section at the top of our website has links to the areas schools, utility providers, change of address information, and other links. A tried an true proverb that must’ve been written by someone who moved a few times! Friends and family are the stand-by, but if they’re unavailable to help, hiring labor is a sure thing. UHaul offers vetted moving help that is reliable, inexpensive, and customer-rated. 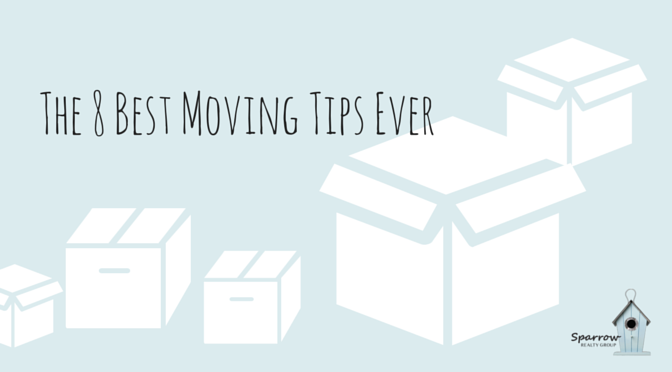 These tips have helped us immensely in each of our moves. You can find more moving tips and tricks at UHaul’s blog http://movinginsider.com/. They have suggestions for all types of moves, from driving a moving van, to moving in to a college dorm. This entry was posted in Sparrow Realty Group. Bookmark the permalink.